Black smudges of road and green splashes of pine trees peeking from their snow covers are the only colours in a blinding white landscape that flashes past as I head south to Saariselkä, Lapland. I’m toasty warm in a bus heated to 26°C. Outside it’s -13°C. This is the perfect time to visit Finland. 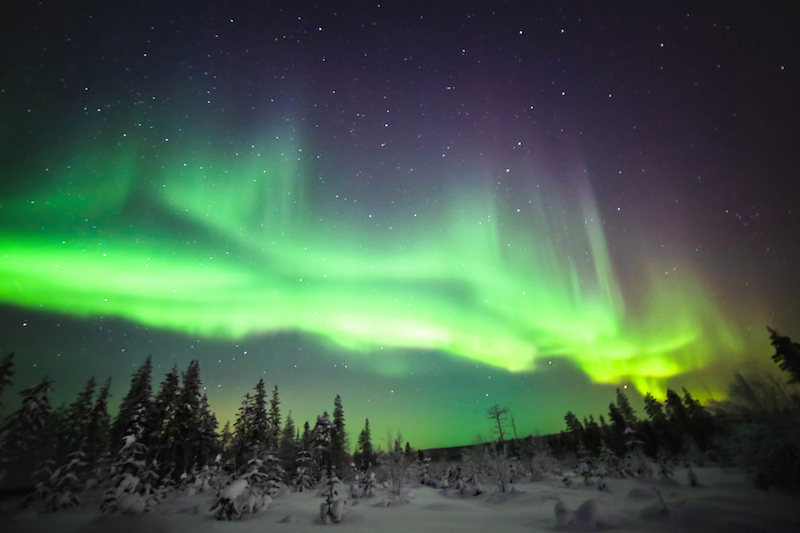 It may be cold, but with winter’s longer, darker hours, there’s more chance of seeing the Northern Lights. 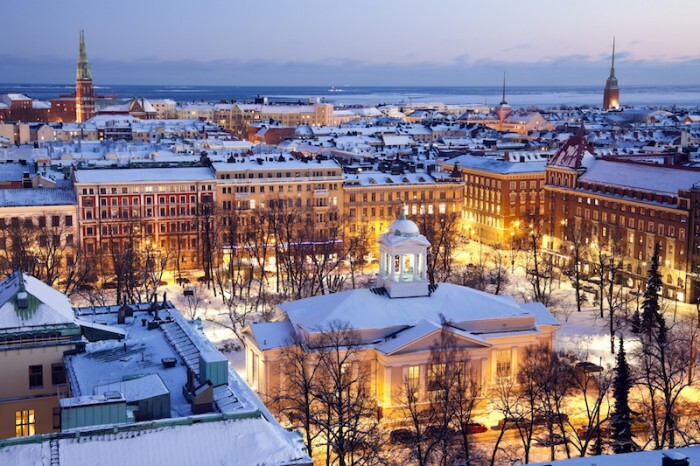 And having not experienced dog sledding, ice fishing, reindeer sleigh riding or snowmobiling, all on offer in a Finnish winter, it’s the ideal time of year to visit. Especially when experienced with a bit of luxury. I luxuriate in my own sauna within my hotel bathroom, then pop out onto the balcony. Apparently it’s good for the health to go out in the cold after the heat. I stay only a few minutes, surveying Saariselkä in the frigid air of Finland’s northernmost ski resort. Snow covers everything. I hurriedly pull my many layers on and head outside. On the edge of town, only my eyes uncovered, I watch green lights flit across the sky above dark arrowheads of pine, dancing and weaving, disappearing then reappearing. It’s one of those magical travel experiences that truly exceed the expectations and the photos. Supplied boots, woollen socks, padded overalls, and gloves, on top of my own many layers, make me feel like the Michelin man. But I’m thankful for them as I step off the bus at the husky dog farm, around 20 minutes from Saariselkä. I hear dogs yelping long before I see them. Teams of five await harnessed to wooden, cradle-shaped sleds. As soon as the sled rope is untied from a tree, we’re off. Snow sprays behind the sled in front, like water from car tyres. Early morning sun in the cloudless sky glints off snow crystals; the huskies’ barking fills the snowy serenity. Their panting breath hangs in the air like puffs of smoke. The dogs quieten when they’re running. 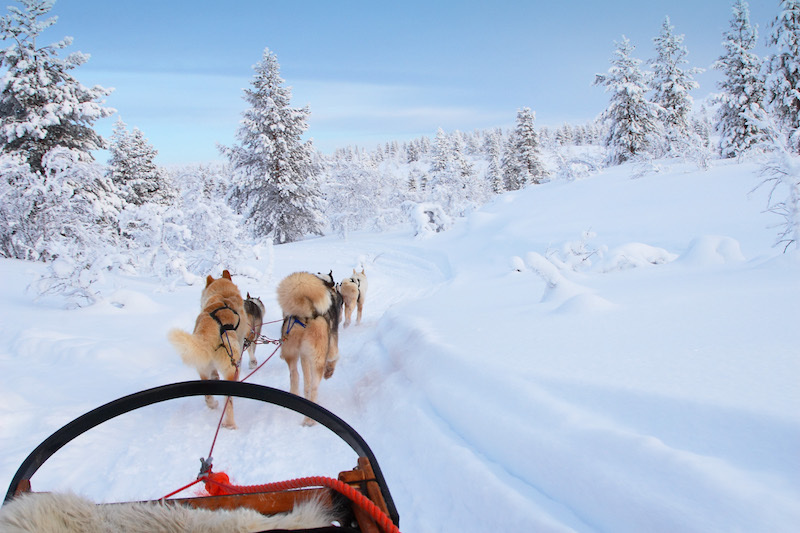 It’s silent except for the jingle of their harnesses and the sled swooshing through the snow in the still forest. I look behind. My driver’s eyelashes are mascaraed with ice. Ten kilometres later, back where we started, we’re spoilt with an open fire, soup and warm berry juice. Then it’s my turn to drive. Thankfully, because I’m a little nervous about driving, the huskies know what they’re doing. I brake occasionally on the metal pronged bar so we don’t run into those in front and help push on inclines when the dogs slow. I puff, but my frozen face is forgotten behind a giant smile. 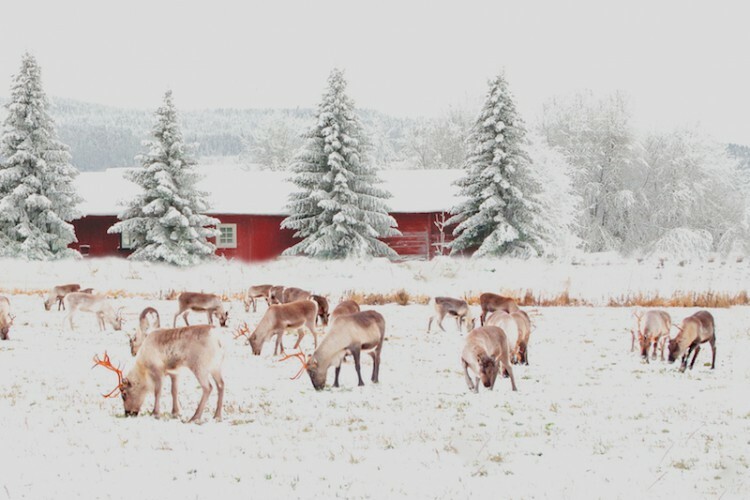 A reindeer sleigh ride at a Sami village the next morning is more sedate. Wrapped in a blanket, with the sun peeking through the trees, I feel like I’m in a glittery Christmas card scene. Particles of snow sparkle in the dim forest, and the national costume of the Sami herder, with its red and greens, reminds me of elves. It sets the scene for Santa’s Village in Napapiiri. 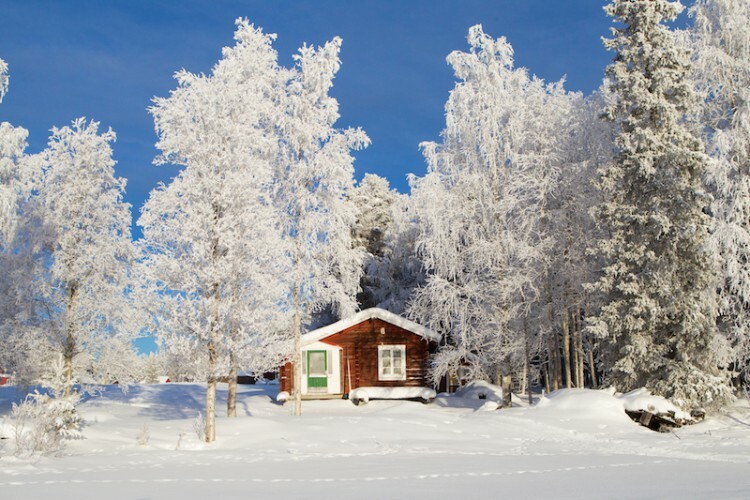 Situated on the Arctic Circle, there are holiday cottages, picturesque with a Christmas tree on the porch, a hotel, restaurants, sleigh rides, a post office for mailing Christmas greetings, and shops galore stocking Christmas decorations or exclusive Finnish handcrafts. In a cosy room full of books and letters, I get a chance to chat with Santa. Then we head west to Sinetta, where the snow hotel is extraordinary. Reindeer fur-covered mattresses are set in ice bases where guests sleep in fleece-lined, arctic sleeping bags. Ice sculptures decorate rooms, artwork is carved into ice walls, and coloured lighting adds an other-worldly glow. Down an icy corridor, I find the ice bar. On a fur-covered ice stool, I enjoy a warm berry juice in an ice glass. It’s all very… icy! And fun. But at between 0 and -5°C, I retreat to my heated, glass-ceilinged igloo. With a 360° degree view of the sky from my bed, I fall asleep stargazing. The Northern Lights may appear during my sleep, but there’s no chance I’ll miss them. A Northern Lights watcher at the complex monitors the skies throughout the night and a buzzer that announces a sighting wakes me. With a push of a button, I incline my bed. Outside it’s -26°C. What luxury to snuggle under a feather duvet watching chiffon-like curtains of green dance across the black sky. It’s on the frozen river I spend the most time in Rovaniemi. Hurtling across it on a 300kg red-and-black snowmobile, we then turn and pass by snow-laden trees. We stop at white, wide open space in the middle of the lake: ice-fishing time! We drill into the frozen lake with large corkscrew-type tools. Eventually, brown water erupts onto the white surface as mine breaks through. I drop a line, rubber maggot on the end, attached to a 12-inch plastic rod into the hole and wait... The hole starts freezing over, the line resembles an icicle. Perch, pike and trout remain unseen. Giving up, I appreciate the warmth of an open-fronted tepee and am treated to sausages cooked on an open fire.